Get ready to make gumbo, soup and casseroles with the versatile (and extremely healthy) vegetable, okra. Fry it or boil it, but first, make sure you store it properly. With some everyday tools and a few simple steps, you can store it correctly and be prepared for whatever okra recipe strikes your fancy. Put the drained okra into a plastic storage bag (suitable for freezing) and seal it. Remove as much air as possible when closing; this will help prevent freezer burn. The okra will store in the freezer for up to 9 months. 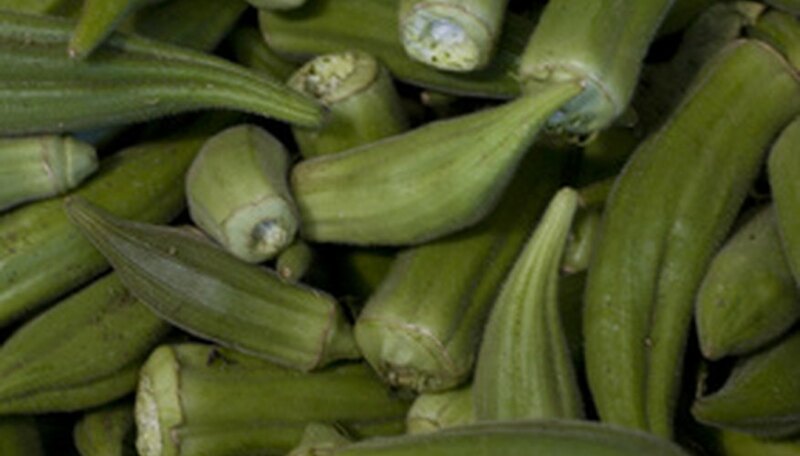 For short-term storage, okra can be stored in a plastic bag in the refrigerator for 2-3 days. When storing okra in the refrigerator, do not wash it before putting it into a plastic bag, because the moisture will promote mold growth. Prepare a spot in the garden that gets full sun, which is necessary for okra seed germination. Pull any weeds out of the chosen spot. Put the seeds in a small bowl. Place the bowl in a freezer overnight. The temperature of the freezer cause the water molecules in the okra seeds to expand, create small cracks and make it easier for the seeds germinate. Plant the seeds 1 inch deep and 12 to 24 inches apart. Water the soil so it is thoroughly moist. Maintain a moist soil at all times during the growth cycle. The seeds should germinate within 14 days. Fill a 5-gallon container with potting soil. Place three okra seeds onto the top of the soil in the center of the container. Space the seeds approximately 6 inches apart. Cover the seeds with ½ inch of potting soil. Water the soil in the container generously to saturate it. Provide water for the okra plants in the container approximately three times per week or when the soil becomes dry. Place the container in a sunny location. 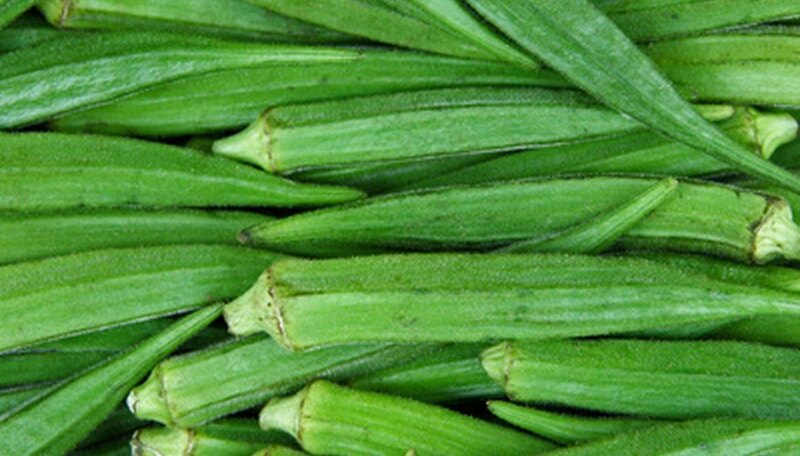 Thin the okra plants when they reach 4 inches in height. Pull up two of the plants, leaving the strongest and healthiest plant to continue to grow in the container. Fertilize the okra plant for the first time when it reaches 6 inches in height. Mix the fertilizer with water according to package recommendations for the container size. Carefully pour the fertilizer onto the potting soil around the okra plant. Fertilize the okra plant one more time when it begins to bloom. Harvest okra when the pods are 3 inches long. Clip off the pods with pruning shears. Continue to harvest okra each day to keep the plant producing. Leave okra pods on the plant until they are dry, but harvest the pods before they open and release the seeds. If you have only the pods, put them in a cool, dry place until they are dry. Open the dry okra pods with your hands and scoop out the seeds, placing them into a bowl so they don’t roll away. Feel the seeds with your fingers to see whether they are dry. Pick through and discard any seeds that look bruised or damaged. Place seeds that are still damp on a clean cloth and set them in a cool, dry place for up to a week to finish drying. Put the dried seeds into an airtight plastic bag or jar for storage. Soak okra seeds in water overnight. Place three seeds per peat pot in germination tray. Place germination tray under halide light fixtures in well-ventilated area. Use 40 watts per square foot of gardening space. Leave lights lit for 8 to 10 hours per day. Moisten peat pots daily. Water should remain present, but the peat pots should never drip or become soggy. Remove the two weakest plants three to five days after seeds sprout. Break open sides and bottom of moist, drained peat pot and place entire cell into soil-filled gardening container. Plant shallowly, 3 to 5 inches deep, as okra prefers well-drained soil. Water each plant with 1 inch of water per week. Maintain lighting schedule. Pods appear in approximately two months. Harvest pods of 2 to 4 inches long every two to three days. Pods will continue to produce after first harvest. Okra prefers to grow in soil that is neutral or slightly "sour," meaning a soil that has a pH lower than 6.0. Preferred pH levels for okra are 5.8 to 6.5; proper fertilization can adjust these levels. North Carolina State University's horticulture department recommends applying a 10-20-10 nitrogen-phosphate-potash fertilizer to okra plants. Okra grows best in phosphate-rich soil. While adding nitrogen to the soil benefits okra plants, an application of too much nitrogen too soon after planting may interfere with production of the okra pods during fruiting. Properly fertilized okra results in plants with deep, green leaves and sturdy stems. When fertilized with a nitrogen-rich fertilizer at the appropriate time, the nutritional value of okra pods also increases, according to a study published in the Australian Journal of Basic and Applied Sciences. Apply small amounts of phosphate-rich fertilizer to the soil before planting. Amounts are usually indicated on bags or packages of fertilizer. Once blooms begin to form, use a nitrogen-rich fertilizer to encourage the formation of strong, healthy okra pods. Okra seed is planted anytime between March and August in Florida. Okra is ready for harvest in 50 to 75 days, so two crops of okra may be grown in one year. Plant the seeds 1 to 2 inches deep and 6 to 12 inches apart. Leave 24 to 40 inches between the rows. The best time to plant okra in Central Florida is from March through July. It takes approximately 50 to 75 days from planting to harvest. Plant tomatoes in January through March for a spring crop, then again in September for a fall crop, avoiding the heat of summer.